Description of "A New India - Volume 1"
As the Soul of India presses towards life in these dark times, a New Spiritual Knowledge is once again given to her people, that Love and Light may shine in the hearts of many, bringing Healing and Blessing to all. 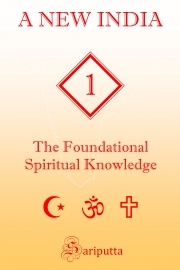 This work is the first volume in a series of essays which lays the foundation of such Spiritual Knowledge. Through this Knowledge the longed-for ideal of a “New India” may emerge. Happy is he who gratefully receives and absorbs this Knowledge, for in it also lies the bridge to The Primordial Light and to Eternal Life. Reviews of "A New India - Volume 1"